Manipulating the Pointwise Grid Model from within a CAE plugin can be a little confusing. This leads to customers contacting our Support Team with a plugin development question that starts with the phrase “How do I…?” As always, our Support Team is happy to help you with anything Pointwise, including your plugin development questions! This installment of Plugin How-To deals with Adding solver attributes to your plugin. Q: How do I add a solver attribute to my plugin? The Pointwise CAE plugin SDK provides an interface that allows a plugin to publish one or more plugin-specific attributes. During export, the plugin can query the grid model to obtain the value assigned to each attribute. An attribute’s value can be set by the user from within the Pointwise application through the CAE/Set Solver Attributes… menu or through a Glyph script using the pw::Application setCAESolverAttribute action. In addition, Glyph scripts can discover all published attributes using the pw::Application getCAESolverAttributeNames and pw::Application getCAESolverAttributeDefinition actions. From a plugin’s perspective, a solver attribute represents a special, global value that is only meaningful to the plugin itself or the solver to which the plugin is exporting. A plugin can write an attribute’s value to the exported data (e.g. FreeStreamVelocity), or use it to control the plugin’s export behavior (e.g. CellExport in the OpenFOAM plugin). Pointwise and Glyph use attribute information to control runtime behavior. As a result, a plugin must publish all of its attributes when it is first loaded into memory. A plugin using the C API publishes its attribute definitions from within the runtimeCreate() function using the caeuPublishValueDefinition() function. A plugin using the C++ API publishes its attribute definitions from within its override of the CaePlugin::create() virtual class method using one of the CaePlugin::publishTypeValueDef() base class methods. An attribute’s name can be any alpha numeric text string that is unique within a given plugin. The name is displayed by Pointwise and is used in Glyph scripts. Although not required, to be consistent with other CAE attributes, it is suggested that attribute names should use upper camel case. That is, a name should start with a capital letter, not use spaces, and each sub-word within the name should be capitalized. For instance, MachNumber, Pressure and FreeStreamVelocity are upper camel case names. The default value is used to initialize an attribute when a solver is first activated. This occurs when the user changes solvers using the CAE/Select Solver… menu. This also happens in Glyph scripts using pw::Application setCAESolver. When a Pointwise file is loaded, the solver saved with the file is activated with attributes set to their respective defaults. However, any changes to these attributes that were saved in the file are then applied. The attribute description is used for documentation and user interface purposes. A description can be any text value. The access control settings control if an attribute is readable (R), writable or both (RW). Unless changed, attributes published by plugins default to readable and writable (RW). An attribute’s range controls which values are valid. Setting a range is optional. If a range is not specified, all valid values are allowed. As shown in the image, the description and range information is displayed in Pointwise as an input field tooltip. How a range is specified depends on the attribute’s type. The range settings for each attribute type are detailed below. The range for integer or real types is specified as a min and max value (inclusive). If appropriate, a typical range can also be specified where, min <= minTypical < maxTypical <= max. Only the min and max range is enforced at runtime. Values entered by the user that are outside the min/max range are rejected. In Glyph, setting a value outside the min/max range is an error. The range for boolean types defines the tokens that represent boolean true and false values. By default the tokens true and yes map to boolean true values. The tokens false and no map to boolean false values. The range for string types is a pattern and an optional min and max length. The pattern can be a regular expression or a glob expression. The pattern is used to validate string values. A regex pattern is delimited with slash characters (/regexPattern/). A glob pattern is delimited with colon characters (:globPattern:). The range for enum types specifies a list of valid token strings and (optionally) each token’s associated integer value. Enumerated types are used for attributes that have a finite set of allowed values. For example, a Units attribute may only allow the values (tokens) Inches, Feet, Meters, and Millimeters. If a token is not given an explicit integer value, it assumes the value of the previous token in the list plus one. If there is no previous token, its value is zero. Each token must be unique within an enum definition. However, the associated integer values may be repeated. The image below shows the Set Solver Attributes… dialog box generated in Pointwise by the following code samples. puts "...Value  : [pw::Application getCAESolverAttribute $name]"
This entry was posted in Applications, Software and tagged Attribute Types, Attributes, CAE, CFD, export formats, Glyph, grid model, mesh generation, Plugin SDK, Pointwise, software engineering, Solver Attributes. Bookmark the permalink. Great post! 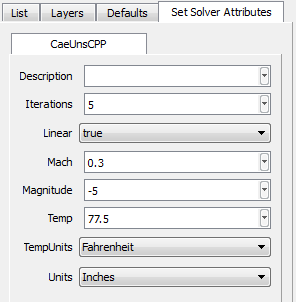 That said, the unit Celsius is misspelled as “Celcius” in all 3 API examples.